Any player that has spent any time playing online poker in rooms like PokerStars and understood the poker strategy, will surely have questioned whether their playing setup is the most conducive for making money at the Internet card rooms. In poker forums, there are many threads showing off the most elaborate online poker setups, many including multiple monitors, state of the art computers, and other accoutrements. For a player that plans on spending long hours playing the online game, the truth is that having the right setup is important and will make a difference in the overall profits that the player sees, but it doesn't need to cost an arm and a leg to get a comfortable arrangement that will allow the player to be in the best mental and physical position to make money. To start with, the computer is the basic piece of equipment that will be needed to start playing online poker on a regular basis. Contrary to popular belief, the type of computer does not need to be extremely fancy as most of the online poker software programs are not heavy on system resources. If the computer will be used for mainly online poker, there are a couple of considerations to be made. 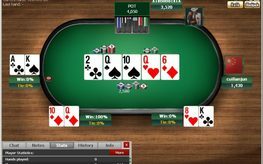 For a player that will multitable more than four tables at once, having a second monitor can be a huge help, making it easier to see the action on all of the tables at once as well as avoiding a costly misclick. This means that the computer will need to support a dual monitor setup. Although most newer computers have this capability built into the system, older computers can be upgraded to include the necessary video cards. A player should also be willing to splurge a little and pick up a nicer wireless mouse that will prevent cords from getting in the way of winnings. As important as the actual computer, a player will need to also think about the desk that the computer will sit on as well as the chair where they will be parked for hours at a time. A desk can be anything as simple as a folding table as long as it is the right height for the player and can accommodate the two monitors and any additional components needed. The chair, however, is another matter. Because a player may spend a great deal of time in the chair, it is important that it is ergonomic, comfortable, and provides plenty of support for the neck and back. Maintaining correct posture during poker sessions is essential to avoid potential health problems. Having the right computer, chair, and other items is a large part of a good online setup, but they will not make a difference if a player does not put themselves in a good playing environment. The playing room should have limited distractions and many players choose to get rid of any televisions or other electronic devices that could lead to losing attention at the poker games. Some top players prefer to have a stereo play classical music while they play, a trend that carries over from studies of how this genre improves the study habits of students.